Donkey Kong Jr. is an Arcade and Nintendo Entertainment System game. It is the successor to Donkey Kong. 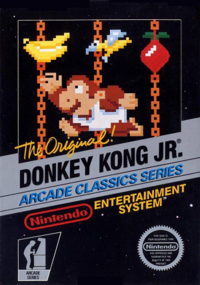 Donkey Kong Jr. features a character known as Donkey Kong Jr. as the protagonist rather than Mario. Donkey Kong Jr. must navigate maps to save Donkey Kong, while climbing vines along the way. This page was last edited on 6 April 2019, at 15:45.